HMS Tamar (P233) became the latest second-generation River-class ship to be officially launched, lowered into the water at BAE System’s Govan yard, then towed three kilometres downstream to the firm’s Scotstoun facility, where fitting out takes place. There she joins Ship No.3 in the class, HMS Trent (P224), and No.2, HMS Medway (P223), which are both being fitted out. It was presented not only by his Commanding Officer Lieutenant Commander Hugh Harris but also by comedian and Phoenix Nights’ Ted Robbins – aka Peter Kay’s arch rival Den Perry. «It was fantastic to be presented with this award in recognition of 25 years in the Navy», said Paul. «To have it handed to me by Den Perry however was something else as I am a huge fan of his and he made this really special». If the sea trials run as planned, HMS Medway (P223) should move to Portsmouth early in the new year. 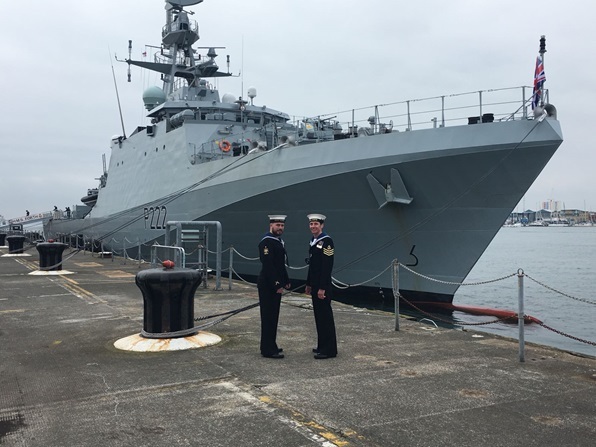 «We on HMS Medway (P223) are extremely excited for the challenges ahead and the imminent sea trials – and subsequent first entry into Portsmouth», said Lieutenant Commander Harris. «My ship’s company continue to work hard to meet every future milestone and ultimately fulfil all the responsibilities required of her as she comes into service next year». By then, HMS Forth (P222) – the lead ship in the second generation of River-class vessels – should be back at sea. Problems with her have kept HMS Forth (P222) in Portsmouth throughout the summer of 2018, but following rectifications by BAE, her crew are expected to move back on board in November with trials resuming in the second half of January. The final ship in the class, HMS Spey (P226), is due for launch. All five vessels will perform a mixture of fishery protection work and general maritime security duties in home waters – with the ability, like their first batch of Rivers, to conduct overseas patrol missions as well. HMS Trent (P224), the third of five new River Class Offshore Patrol Vessels (OPVs), was officially named on March 13, 2018 during a ceremony at BAE Systems’ site at Govan, Glasgow, as final preparations were made before she enters the water for the first time in the coming days. To mark the occasion, employees and guests watched as Mrs. Pamela Potts, Trent’s sponsor and wife of Vice Admiral Duncan Potts, named the vessel which will aid in a range of operations including counter-terrorism and anti-smuggling to secure the UK’s borders. Mrs. Potts released a bottle of gin from the Nelson’s Gin Distillery & Gin School in Stafford against the ship’s hull to officially name the vessel. 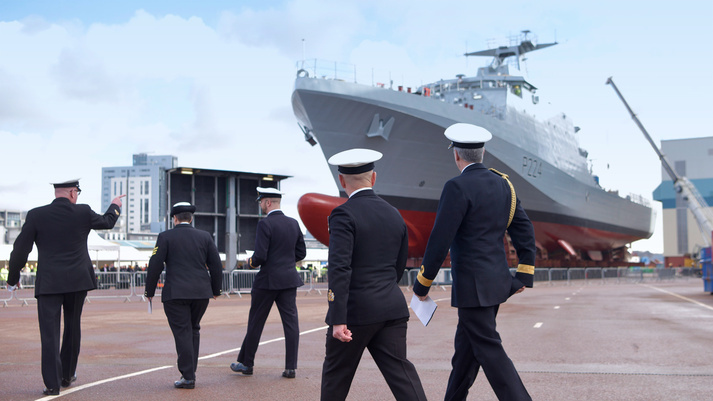 Iain Stevenson, Managing Director of BAE Systems Naval Ships, said: «This is another landmark moment for the River Class Offshore Patrol Vessel programme and an important day that honours the traditions of the Royal Navy. Today is made even more special as we are able to see the full scale of Trent as she prepares to enter the water for the very first time in the next few days. This is yet another reminder of the importance of what we do». Defence Minister Guto Bebb MP said: «As the third of five Offshore Patrol Vessels being built in Scotland, HMS Trent (P224) will soon be part of a fleet of highly capable ships. These new vessels will keep the UK safe by conducting counter-terrorism, anti-piracy, anti-smuggling and other vital maritime operations. 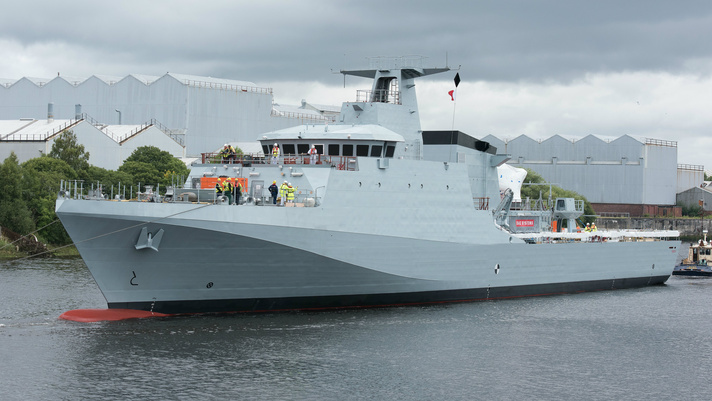 UK Defence has invested in an unprecedented ship-building production line in Glasgow and the city’s shipyards with their 1,700 highly skilled engineers and technicians are benefiting from full order books for the next two decades». After the Naming Ceremony HMS Trent (P224) will be loaded onto an awaiting barge which will then lower her into the water before her outfitting and systems installation. HMS Trent (P224) is expected to be delivered to the Royal Navy in the second half of 2018. In February, HMS Forth (P222), the first of five River Class OPVs departed Glasgow and her birthplace on the Clyde, to make her way to the home port at Portsmouth Naval Base. 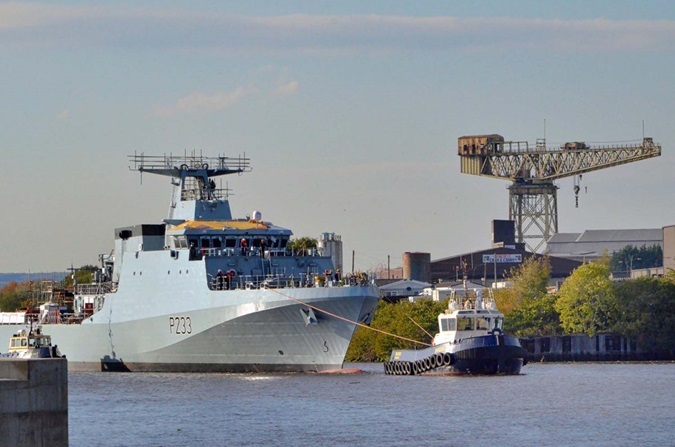 This was a significant milestone in the programme as HMS Forth (P222) is the first completed complex warship to leave Glasgow since HMS DUNCAN in 2013. The second in class, HMS Medway (P223), named in October 2017, is set to depart for sea trials in the first half of this year. The fourth ship, HMS Tamar, is now structurally complete while the final River Class OPV, HMS Spey, is under construction at BAE Systems’ Govan yard.